Introducing a refreshing new way to get your vitamins! 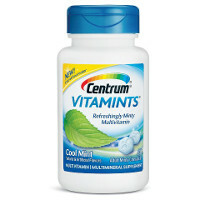 New Centrum® VitaMints® contain essential nutrients you enjoy like a mint. Featuring a cool new mint flavor without any kind of chalky taste. Can be taken with or without food or water.